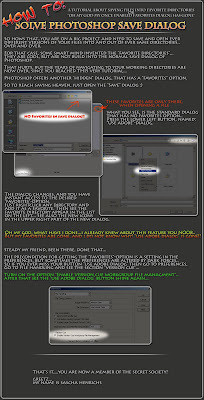 need to save into favorites folders in photoshop CS2 and CS3? no more favorites in the photoshop save dialog? ok, time for you, to see this cool tutorial!! Enable "Items displayed inPlaces Bar"
type the path to the desired location. Alternatively navigate inside the Explorer to the desired location, and copy/paste the path.